Hi ya everyone, I made a fun card today using a Kenny K image called, Rad Boarder. Truly, Kenny K has some awesome images for boys and teenagers in general. 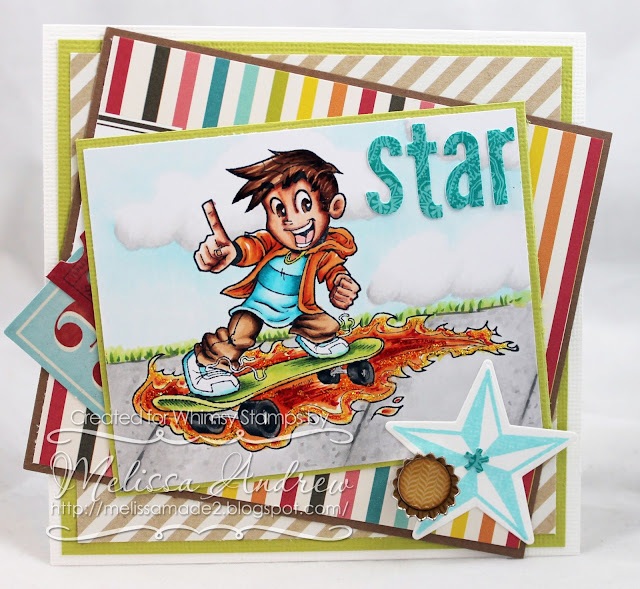 These creations can be some of the hardest to create too, but they are much easier with Kenny K.
I created this card using not only the Kenny K image but also the Sun, Moon, Stars stamp and die set! Love this combo, the stamps and dies work so perfectly together. I also used my Copics, some fun papers and stickers. For more inspiration using gorgeous images from Whimsy Stamps join us on the blog! Gorgeous coloring, love all the detailed shading on it.. This is AWESOME Melissa!! Love it! I'm never any good at boy cards and i have 3 boys no girls lol.